Nitin Gandhi, the 23-year-old founder of Chandigarh-based LBD Makers, has sold more than five entry-level three-dimensional (3D) printers that cost between ₹ 75,000 and ₹ 1.5 lakh since he started manufacturing 3D printers this January. “My clients include colleges and hobbyists. I am also getting inquiries from ‘maker spaces’, where such hobbyists hold their meetings," said Gandhi. Thirty-year-old Arvind Nadig, co-founder of Bangalore-based Brahma3, on the other hand, started his 3D printer manufacturing business in October and is taking “pre-orders". His “indigenously-made" printers cost upward of ₹ 1.2 lakh and he is targeting consumers, small offices, architects, designers and similar professionals. Gandhi and Nadig are part of the fledgling Indian 3D printer market that promises to change the face of small-scale manufacturing. Mumbai-based Karan Chaphekar has been building and selling machines based on the open source RepRap concept since 2010 till he set up his own company, KCbots, in 2013 and developed the KUBE and KUBE Mini 3D printers. “You don’t have to be an engineer to use these machines: Just unpack, plug them in, and start printing!" reads his website. Short for replicating rapid prototyper, RepRap is an initiative to develop a 3D printer that can print most of its own components. Angad Daryani, a 15-year-old school dropout from Mumbai, plans to introduce his SharkBot range of printers for just around ₹ 20,000. Daryani develops mechatronics projects based on open source hardware and software, and also does research on the behaviour of sharks, which explains the SharkBot name. “Here at Shark Industries, we took up the challenge to build a robust, low-cost and presentable 3D printer... We had shut down the firm for one year since our products development wasn’t satisfying our goals and plans. We’re coming back with a product line which is sure to hit the market hard," reads his website. Daryani plans to retail the 3D printers at his father’s computer peripherals business, Kunhar Peripherals Pvt. Ltd.
3D printing is promising to change the way people manufacture goods and do business. The technology has been around for almost three decades, but is finding mainstream support in the last two-three years, especially in India, where basic 3D printers and DIY kits are being sold to hobbyists and small companies for anywhere between ₹ 40,000 and ₹ 1.5 lakh. Industrial-use 3D printers from companies like Stratasys Inc. (Altem Technologies Pvt. Ltd are its resellers in India) could cost up to ₹ 3 crore, depending on the volume of manufacturing to be done, and the quality of material provided. The company has sold over 100 3D printers till date in India, according to an Altem Technologies sales manager, who did not want to be named. Fabbers, or personal manufacturing machines—3D printers come under this category—now not only make jewellery and toothbrushes, but also football boots, racing-car parts and even custom-designed cakes. Stratasys’ 3D printing technology, for instance, has made everything from prototype drone wings to robot exoskeletons for children. 3D printers fabricate complex objects by depositing materials, layer by layer. The most common household 3D printing process involves a “print head", which allows for any material to be extruded or squirted through a nozzle. Others use a laser beam or glue to selectively fuse powdered plastic, metal or ceramic in layers. A user selects an electronic design blueprint and loads the raw materials into the 3D printer. The machine does the rest. A solid 3D object is printed using a 3D printer directly using computer-aided design data. There are several different additive processes including selective laser sintering, direct metal laser sintering, fused deposition modelling, stereolithography and laminated object manufacturing. All of them differ in the way layers are deposited to create the 3D objects. 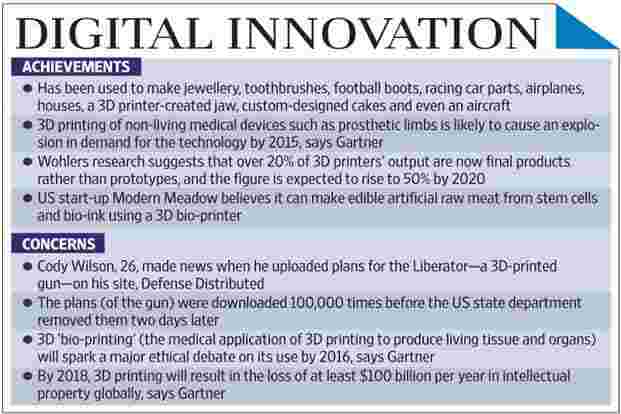 India has seen a transformation in the 3D printing industry with the emergence of local 3D printer manufacturers, according to a 10 October 2013, report by research firm Gartner Inc. The report had forecast worldwide shipments of 3D printers, priced at less than $100,000 (around ₹ 60 lakh), to grow 49% in 2013 to total 56,507 units. It noted that in mature Asia-Pacific economies, shipments of 3D printers are forecast to touch 3,817 units in 2013 and 70,295 units by 2017, while in emerging Asia-Pacific markets, total shipments are expected to reach 1,643 units in 2013 and more than 14,800 units in 2017. Greater China’s emphasis on developing its additive manufacturing base, including national, regional and city government initiatives to support business and research initiatives, will drive strong growth, the Gartner report added. In India, the 3D printer market is nascent, according to 3D printer makers who also provide 3D printing services and DIY kits that can be merged with imported products and labelled “Made in India". The printers, they say, are mostly used by smaller companies to “verify industrial designs and not for mass production". According to Viral Sachde, founder of Bangalore-based Cycloid System, who supplies 3D printers “to companies and educational institutions" since May 2012, “our clients typically are those who want to do industrial prototyping and make 5-10 units for use in the field". He added that 3D printers in India are mostly the “thermo-plastic" variety (as opposed to 3D metal printers) and are used for “customization of products in smaller volumes". Globally, researchers at the University of Colorado Boulder have gone a step ahead and added a fourth dimension, or 4D, to their printing technology which, they said in a 22 October 2013 press statement, opens up “exciting possibilities for the creation and use of adaptive, composite materials in manufacturing, packaging and biomedical applications". The 4D printing concept, which allows materials to “self-assemble" into 3D structures, was initially proposed by the Massachusetts Institute of Technology faculty member Skylar Tibbits this April, when Tibbits and his team combined a strand of plastic with a layer made out of “smart" material that could self-assemble in water.